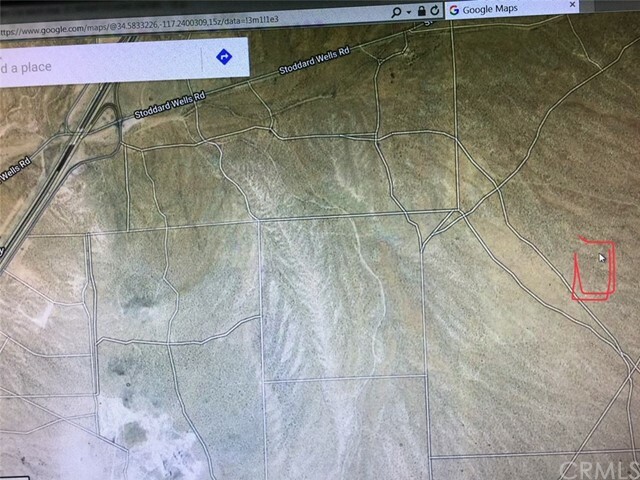 5 acres Northeast of Apple Valley area, about 1.75 miles from 15 Fwy and Stoddard Rd. After Exit from 15 Fwy, go east on Stoddard Rd., then South on Outer Highway 15, then go north to Saugus Rd, and go east. Saugus Rd. ; changes name to Los Padres Rd. This property located about 1.75 miles from Saugus Rd. The Los Padres Rd turns north and property is located 0.5 miles from turning point, The seller has 10 Acres (APN : 0472-311-10) within same section #30. Located South of this property about 1320 feet then 1320 feet East. Asking $200,000. Wal Mart Distribution Center has 1,340,000 Sq.Ft. and is located on the Southeast corner of Johnson Rd. and Dale Evans Rd., about 3 miles Northeast of this property. See Assessor's parcel map for a more accurate direction. Thomas Map Page are 4207-D5. Zoning is Residential Low Density (RLD) and requires minimum 2.5 Acre lots.